Fashion Week is a huge part of the fashion culture. It takes place all over the world with New York, Paris, London and Italy, with the ladder being the most grand of them all. It’s a week full of fashion runway shows where designers showcase their newest pieces for the upcoming season. It’s a way for the designer to sell their pieces. For this reason, the shows take place a season ahead of time. It gives buyers time to place orders for their stores and for the products to come in on time. It also gives fashion journalists time to prep their fashion magazines for the upcoming season. This week it took place in New York City from September 5-12. The following is a recap of some of this week’s runway shows. Day one consisted of the following designers: Nicholas K, David Tlale, BCBGMaxAzria, Richard Chai, Supima,Tadashi Shoji, Candela, Desigual, Marissa Webb and The Art Institute of NYC. Designs varied from bright to neutral colors, casual to evening wear, loose-fitted to fitted styles, etc. Many of the designers showcased very flowy pieces with overlapping fabric, creating a flowing and sweeping movement when in motion. Such pieces were seen in Nicholas K, BCBGMaxAzria and Tadashi Shoji’s collections. Flowy pants were also common as seen in Richard Chai and BCBGMaxAzria’s collections. Other common aspects throughout the collections were cutouts found in Supima’s collection, geometrical prints and patterns found in Richard Chai’s collection and neutral, light colors found in Candela’s collection. Some of the collections that stood out to me were Candela’s, Desigual and Supima. Candela had a very youthful and romantic feel to it with its lighter tones, lace, bows, crop tops and pointed flats. Desigual popped a lot with its bright colors and eccentric patterns consisting of florals, stripes, and abstract shapes. Desigual also showcased a few monochrome pieces along with wide-brimmed hats and round sunglasses as accessories. Supima had more evening wear in its collection. Some of the dresses consisted of cutouts, fitted tops and flowy or full bottoms. I also found it interesting that some of the pieces had cape-like back pieces. Looks like Gwyneth Paltrow sure made a statement in her Tom Ford caped dress earlier this year for the Oscars in April. Designers: Fashion Law, Zimmermann, Project Runway, Carmen Marc Valvo, Noon by Noor, Nautica, Revecca Minkoff, Tome, Nicole Miller, Todd Snyder, Argentine Designers, Elle Fashion | Next, Academy of Art University and Mark and Estel. Designers: Ruffian, Lacoste, Jill Stuart, Son Jung Wan, Mara Hoffman, Malan Breton, Herve Leger by Max Azria, Katya Leonovich, Charlotte Ronson, Monique Lhuillier and Venexiana. Day four consisted of the following designers: Lela Rose, DKNY, Tracy Reese, Custo Barcelona, Trina Turk, Diane Von Furstenberg, Joanna Mastroianni, Y-3, Vivienne Tam, Zac Posen, Ralph Rucci, Ricardo Seco and Emerson by Jackie Fraser-Swan. This day had a lot of black and white, monochrome pieces, with a splash of color pieces present throughout the show. 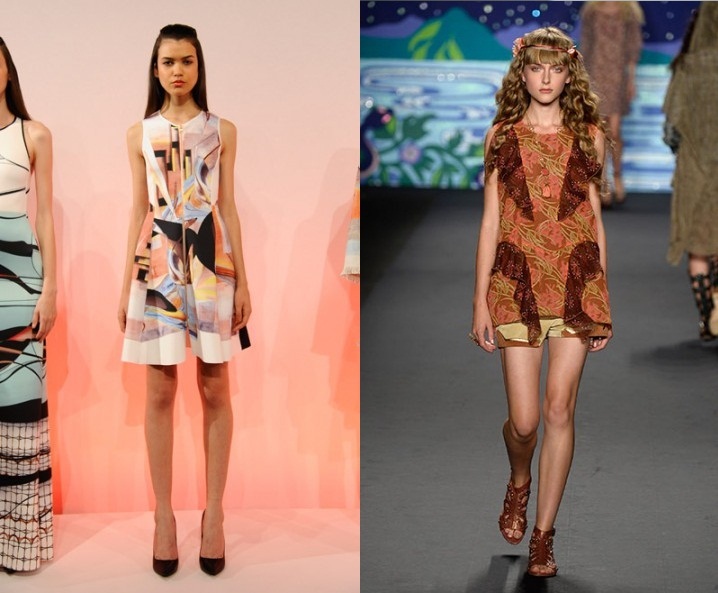 The colored pieces were bright with more patterns ranging from stripes to floral to Aztec prints. Metallics were also present in a few pieces. There was some evening wear, as in Zac Posen’s collection, accompanying casual and sport wear, as in the Y-3 and DKNY’s collections. Crop-tops, bandeaus and bustiers were seen often on the runway, along with mesh necklines and hems. added a nice touch. As for Custo Barcelona’s collection, what really pulled me in were the colorful Aztec prints of all the pieces. There was lace, feathers and some really nicely cut jackets, along with some fun Aztec printed visors to accessorize the models. Lastly, Zac Posen offered such a beautifully constructed collection. He sent a collection of evening wear down his runway that consisted of full and flowing skirts. Some of these pieces flowed beautifully with lots of layering. Even though these were my top three, some of the other collections consisted of some lovely pieces as well. Designers: Mathieu Mirano, Carolina Herrera, Tommy Hilfiger, Pamella Roland, Hache, Czar by Cesar Galindo, Concept Korea, Donna Karan New York, Falguni and Shane Peacock, Reem Acra, KaufmanFranco and Libertine. Designers: Tory Burch, J. Crew, Steven Alan, Badgley Mischka, Vera Wang, Jenny Packham, Diesel Black Gold, Adeam, Naeem Khan, Dennis Basso, Sass & Bide, Alon Livne, MM6 Maison, Martin Margiela, Zang Toi and Fashion Shenzhen. Day seven consisted of the following designers: Bibhu Mohapatra, Brandon Sun, Michael Kors, Nanette Lepore, Rachel Zoe, J. Mendel, Clover Canyon, Milly by Michelle Smith, Betsey Johnson, Anna Sui, Anya Caliendo, Dion Lee, Osklen and B. Michael America. This day definitely ranged in designs and themes from Michael Kors’ neutral traditional pieces to Anna Sui’s bohemian feel to Osklen’s colorful retro look. but smile and become excited about her collection. Lastly, Anna Sui’s collection was had a very bohemian feel.They had a flowy feel to them with some interesting bohemian prints that appeared to hang well on a woman’s silhouette. Colors were very earthy browns, creams, and darker blues. Since I’ve always been a huge fan of Betsey Johnson, this may have been my favorite day of Fashion Week. Designers: Ralph Lauren and Calvin Klein. Overall, fashion week appeared to have been a success. There were many beautifully thought-out and organized collections. Generally, the big trends I noticed were a lot of lace, stripes, crop tops, cutouts, monochrome, bright and neutral colors. Suffice to say that after all of these shows, I’m definitely looking forward to next spring’s shopping!